Summer is here and the selects are hot off the grill! We start this one off with a Crywolf & Ianborg remix of ‘Stay’ by Kicks N Licks. The remix begins sounding familiar as we hear Crywolf singing with some light guitar in the background- but then comes a massive drop that runs absolutely wild. From there we turn things up another notch with Ramzoid – ‘Turtle Theme’, a serious heater. This track is weirdly groovy and so damn funky it pulls you right in, and we love that about it. 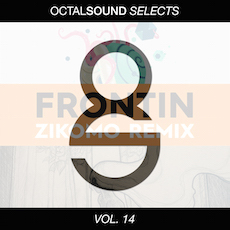 At last we keep the funk going strong with Zikomo’s remix of Pharrel’s ‘Frontin’. Old school jazzy sounding piano and pumping vocal samples- this track starts off funky and gets stronger as it goes. This round of Octal Sound selects will have you working up a sweat!. As always, download the tracks for free HERE and stay tuned to Octal Sound for more great music this summer!